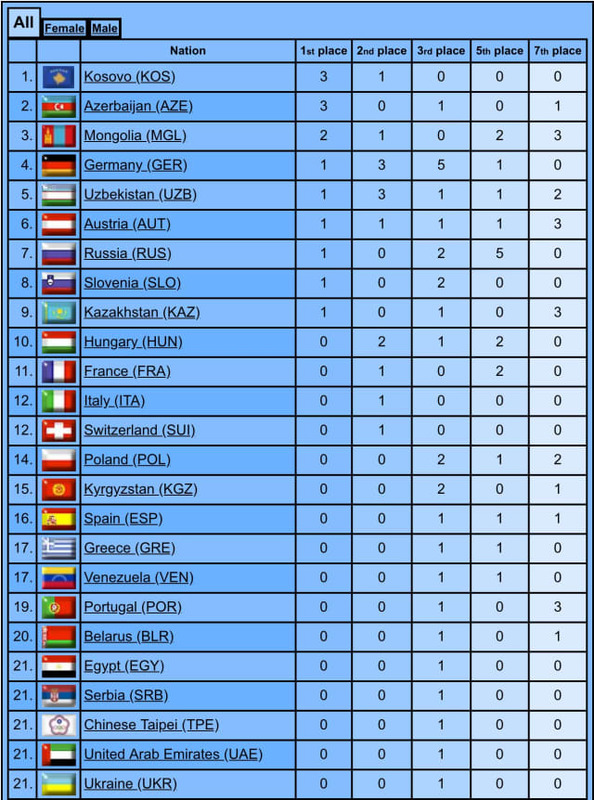 On the last day of the Tashkent Grand Prix in Uzbekistan, the five last categories were in action with the women's -78kg and +78kg and men's -90kg, -100kg and +100kg. Find below all the results and reports about each category. Stay tunned for more information and analysis of the last day of competition. The next IJF World Judo Tour event, will take place in The Hague, Netherlands from November 16-18, 2018. -90kg: MEHDIYEV Wins for Azerbaijan The first final of the day opposed the Hungarian and top seeded athlete, TOTH Krisztian, who had to go to the golden score in the semi-final Mikail OZERLER (TUR), to qualify for the last match. But slightly injured during the preliminary rounds, TOTH did not compete in the final and the victory went to Mammadali MEHDIYEV (AZE). Still looking for a first medal at a Grand Prix, Frazer CHAMBERLAIN (GBR) qualified for the first bronze medal contest against the 2013 world bronze medalist Ivan VOROBEV (RUS). After only a few seconds, both athletes showed their full power, but were incapable of launching a proper attack and they were penalized with shidos. Half way to the end, CHAMBERLAIN was penalized a second time for passivity as he seemed totally blocked by the strong kumikata of his opponent. But it was with an action on the edge of the fighting area, that the British was the most dangerous with a ko-soto-gari but for no score. With 34 seconds left on the scoreboard, he was penalized a third time synonymous of disqualification and the bronze went to Ivan VOROBEV. The 2017 World Junior bronze medallist, Eduard TRIPPEL (GER) was opposed to Mikail OZERLER (TUR), who had no record of any medal for Turkey so far, but was the World silver medallist for Slovenia in 2017. The first dangerous situation came from OZERLER with a ko-uchi-gari but for no score. But then the Turkish was penalized for blocking his opponent. As they were entering the last minute, OZERLER launched an other powerful attack (koshi-guruma) but for no score. It was time for golden score. After 25 seconds, OZERLER launched a o-uchi-gari which was blocked and countered by TRIPPEL with a ko-soto-gari for ippon and a first medal at a Grand Prix for the German. -78kg: KUKA Collects the Third Gold Medal for Kosovo Like her three compatriots, finalists on the first day of competition (2 gold, 1 silver), Loriana KUKA (KOS) qualified with a lot of control for the final of -78kg despite not being one of the seeded athlete when the competition started. In the final, she found on her way the Austrian Bernadette GRAF, who from the first matches was very fit. KUKA immediately seemed to take the mental ascendent over the Austrian, and launched a couple of strong left-handed hip attacks that put GRAF in danger but for no score. As a consequence the latter was penalized with a first shido. After a strong battle for gripping and with the end of the final approaching, both athletes were penalized for passivity. For four minutes, KUKA had tried to apply her hip technique and apparently GRAF was waiting for her in that direction. But this is the moment the Kosovar decided to change direction, with a superb ko-soto-gari for a clear ippon. This is the second Grand Prix Gold Medal for KUKA and third gold medal for Kosovo on the occasion of this Grand Prix. Definitely a superb harvest for Kosovo. The first bronze medal contest of the category opposed the experienced Anastasiya DMITRIEVA (RUS), owner of already 9 Grand Prix medals, and Beata PACUT (POL), bronze medallist two weeks ago at the Abu Dhabi Grand Slam. After 48 seconds, both athletes were penalized with a first shido for passivity. Just before the last two minutes, PACUT executed a uchi-mata that was very close to score, but as DMITRIEVA didn't land on the back or the side, no score was given. In the meanwhile, DMITRIEVA was penalized a second time as the end of regular time was approaching. After 2 minutes and 12 seconds of golden score PACUT received her second shido, putting the two women one shido away from disqualification and a little moment later the Russian was actually penalize, giving the victory to the Polish who won here third medal on a Grand Prix. The winner of the Buenos Aires Panamerican Open 2018, Karen LEON (VEN) faced the 2015 World bronze medallist, Luise MALZAHN (GER). After less than 10 second, the German was the first in action, with a massive hip technique, but for no score. For sure LEON was trying, but MALZAHN seemed stronger on her legs and capable of controlling her opponent. This is what happened after LEON launched an attack that was countered for a waza-ari. MALZAHN could then control the rest of the bout to win her nineteenth Grand Prix medal, a new record! -100kg: GASIMOV is Back Being the current Olympic Silver medallist and top seeded competitor, it was not a surprise to find Elmar GASIMOV (AZE) in the final. But as we announced in the preview of the category, this could be the day of Alexandre IDDIR, as the Frenchman went through the preliminary rounds with a very solid and spectacular judo. With his left-handed guard the first in action was IDDIR who was very close to put GASIMOV out of balance. Being more passive, the Azeri was penalized with a first shido. IDDIR seemed to be in control of the match, when the Olympic Silver medallist engaged a sumi-gaeshi from a distance. The French had no other choice than to follow and after landing on his head, finished flat on his back for ippon. The 2015 Junior European Champion Danilo PANTIC (MNE) was opposed to Veteran Ramadan DARWISH (EGY), who was already a world bronze medallist in 2009, in Rotterdam. In less than 10 seconds, there were already two strong attacks, one with an uchi-mata from DARWISH and a counter attack by PANTIC, but both for no score. That would definitely be the physiognomy of the match, the Egyptian attacking and the Montenegrin trying to counter. Just after the half of the match, DARWISH took the advantage with a hip technique for waza-ari. With less than one minute on the scoreboard, the first penalties were distributed to both competitors for passivity and DARWISH just had to control until the final gong to win his twelfth medal on a Grand Prix. Hard time for the 2015 World silver medallist, who has to struggle to get back to his best level. But Karl-Richard FREY (GER) is stil present in a final block of a World Judo Tour event as he qualified for the bronze medal contest against the owner of two Grand Slam bronze medals (Abu Dhabi 2016, Baku 2015), Joakim DVARBY (SWE). After one minute and 27 seconds, the German was penalized with a first shido for passivity. As the last minute was approaching, a shido was awarded to both athletes but it was still the Swede who was the most dangerous, first with a kata-guruma, then with a o-soto-gari that was very close to score. On the final gong, FREY launched a desperate drop-semi-nage, but once again, nothing was announced by the referee. In Golden score, a confused action was uncertain for a little while until the video confirmed that once more nothing was scored. Finally after 1 minute and 19 seconds, FREY scored an aerial ippon with a massive ura-nage for his thirteenth Grand Prix Medal. +78kg: Azerbaijan Wins Third Gold Medal with KINDZERSKA With 10 medals on the World Judo Tour, Carolin WEISS (GER) was again present in the final block of a major IJF event. She was opposed to the 2018 Abu Dhabi Grand Slam bronze medallist, Iryna KINDZERSKA (AZE). Despite the difference in weight, the first half of the match seemed to be fairly balanced and as the two competitors entered the last minute, only shidos had been distributed, two to WEISS, one to KINDZERSKA. But WEISS started to suffer and was penalized for the third time, KINDZERSKA wining the third gold medal for team Azerbaijan here in Tashkent. For the first bronze medal match, the 2017 The Hague Grand Prix bronze medallist, Sarah ADLINGTON (GBR), faced the winner of the 2018 Agadir Grand Prix Yelyzaveta KALANINA (UKR). The first waza-ari came from the tall KALANINA with a o-uchi-gari. Exactly half way to the end, both competitor were penalized for passivity, but it took fifteen more seconds for the Ukrainian to combine a uchi-mata and a o-uchi-gari to score a second waza-ari to win her fourth Grand Prix medal. Kseniia CHIBISOVA (RUS), bronze medallist in Cancun a few weeks ago, and the winner in Abu Dhabi, two weeks ago, Maryna SLUTSKAYA (BLR) qualified for the second bronze medal contest of the category. After only seventeen seconds SLUTSKAYA was penalized for gripping on the same side of the judogi without attacking. A little later, it was CHIBISOVA's turn to be penalized for passivity and as the end of the match approached, she received a second shido. In the golden score, the Belarus was pushing to make the Russian penalized a third time, but it is on the floor, that SLUTSKAYA finally found an opportunity to apply an arm-lock for ippon and her eighth medal in a Grand Prix. +100kg: BOSTANOV Dominates the Heavy Weight The last final of the day opposed the Russian, Soslan BOSTANOV, who so far had no medal on the World Judo Tour this year, and for the joy of the audience, the Uzbek Bekmurod OLTIBOEV, who ended at the bottom of the podium in Baku last September. The first danger came from the Russian side, as BOSTANOV launched a uchi-mata for no score, but a few seconds later he applied the same technique to score a waza-ari. But OLTIBOEV did not panic and after an unsuccessful attempt with a drop-seoi-nage, scored a massive waza-ari with a left handed shoulder movement. The public exploded with joy, but it was not over yet. Supported by his public like no-one was before, OLTIBOEV continued to attack, but this time the Russian was aware of the danger and he blocked the last attack and controlled the Uzbek on the floor for ippon. The first bronze medal contest of the category was supposed to oppose Iurii KRAKOVETSKII (KGZ) and the giant Renat SAIDOV (RUS), but as the latter was disqualified in semi-final, KRAKOVETSKII was designated as the winner. The last bronze medal contest of the tournament opposed Ikhtiyor KHALMURATOV (UZB), who's best place so far was a fifth place at a Grand Prix (Tashkent 2017) and Yerassyl KAZHYBAYEV (KAZ), who also had no record on the World Judo Tour up to now. After one minute, KAZHYBAYEV was penalized for the first time, but he then scored a beautiful o-soto-otoshi, like only heavy weights do. Ippon and the bronze medal for KAZHYBAYEV.